Mercure Hotel Schwerin Altstadt. Book now! Free WIFI! Enjoy a spectacular view of the castle from the roof terrace at the Mercure Hotel Schwerin Altstadt. Located in the heart of the city center, the hotel has 40 comfortable rooms with flat-screen TV and free WIFI. Attractions such as the castle, museum, theater and Lake Schwerin are all in close proximity to the hotel. Travel from the main train station, which is approx. 766 yards (700 m) away, by bus or tram. If traveling by car, the nearest highways are the A14 and A24. The residents of Schwerin like to call their home town, "The city of seven lakes and forests" - in fact, the capital of Mecklenburg-Western Pomerania has 12 lakes and 2 rivers. Schwerin is also well wooded: almost 20% of the city's area is forested. 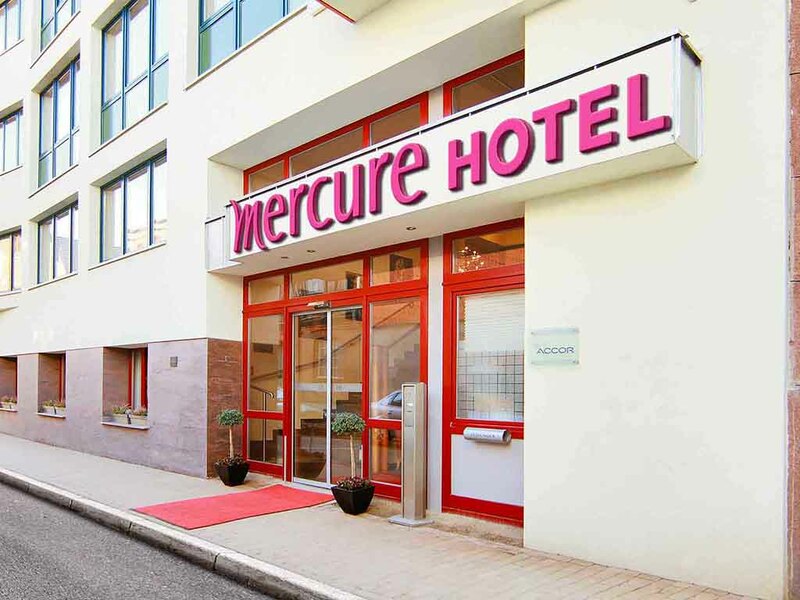 At the Mercure Hotel Schwerin Altstadt, you can choose between Standard Rooms with a single bed, twin beds or a double bed. All 40 rooms have free WIFI and DSL access. Two children aged up to 12 can stay free of charge in their parents' room on request. We will provide you with a crib on request free or charge. Your pet is also welcome to stay with us (charge of EUR 5/night). We will be happy to serve you wine, cocktails, long drinks, coffees and lots more in our comfortable lounge bar, which seats up to 30 and is open every day from 7AM until 11PM. Excellent location and great breakfast. Only 8 minutes walk from Schwerin Central Station. Convenient walking distance to all Schwerin tourist attractions, the beautiful Schwerin Castle & Castle Garden in particular. Quite a relaxing spot in Mecklenburg! We enjoyed it very much. first stay in this hotel due to business trip. hotel is in city center, next to shopping area and famous schwerin castle. rooms are quite old style, breakfast is acceptable but breakfast area is small. Small room in this Mercure. Easy parking in nearly parking house. 7 euro a night hotel rate. The bathroom fan could not be switched off separately from the light. We were not offered the free drink (have silver card). Very expensive breakfast, better take it in town. Not the best Mercure. A must stay location - central, quiet and excellent value for money. Booked Mercure Schwerin Altstadt rather than Accor hotel on outskirts. Parked the car in nearby secure car park (5 Euros per day). Location of hotel meant that we could walk everywhere. Hotel and room very clean - quiet location and friendly staff.Town located in 'Lake District' of northern Germany - very picturesque. Did the bus tour (10.50 Euros - good but only in German). Found an excellent café within 50 metres of Mercure for breakfast - didn't book hotel breakfast. Brilliant Italian restaurant just over the road from the Mercure - pasta and pizzas very good value - only bottled beer available. Good courteous staff. Room clean and well equipped. Didn't try TV as had ipad with me and good Internet in the hotel. My mistake was getting off the train late at night at Schwerin Mittel. No taxis but just a 15 minute walk with cases in the snow. Good breakfast. Excellent shower. In the middle of town but quiet. I had a good view of the city. They had some sort of Internet for guests in the bat but I didn't try it. Easy to book. I stayed at 4 Mercure hotels in Germany this week and this was the best. Many thanks for your lovely review! We are glad that you enjoyed your stay with us and we will forward your kind words to all of our staff. We hope to welcome you again in the future!